Mozart the Eurasian Eagle Owl, winner of the 2008 Lady Gray'l Award, was captive bred in Newent in Gloucestershire in England and raised by Jemima Parry-Jones. Since he considers himself to be a human, he thrived on attention during his childhood at the Royal Academy of Music with Jemima (where he acquired his name), and later from his adoring public at the National Birds of Prey Centre. He loved people so much that he even allowed numerous blind people to experience what an owl was by patiently allowing their hands to feel his body. Most owls would not tolerate such touching and indeed he does not like it normally but seems to understand when it is blind people who need to see by touch. Mozart was the forerunner of trained owls in the United Kingdom and other countries, helping Jemima to develop and refine owl training and care techniques she later published in two books and a video on owls. These experiences also helped Jemima to write the section on care of owls for the Secretary of State's Guidelines for Zoos. Mozart and Jemima came to South Carolina with plans to join forces with the South Carolina Center for Birds of Prey in 2004, but returned to England in 2007 to create the new International Centre for Birds of Prey instead. While in the U.S., Mozart and Jemima visited the College of Charleston in South Carolina. Mozart "happily provided demonstrations of owl courtship," says Dr. Melissa Hughes. "My students were always quite pleased when he favored them with an offer of dead rat." During his life so far, he has likely helped educate over a million people about owls through video, television, programs, and just working on display for his treasured public. For her work with Mozart and other owls educating hundreds of thousands of people about owls, expertise in breeding owls, training owls and their care, owl rehabilitation, and safeguarding the welfare of captive owls through crafting guidelines and conducting inspections, Jemima Parry-Jones herself is also receiving a new Special Achievement Award from the World Owl Hall of Fame. The 2008 Champion of Owls Award winner coincidentally happened to be the International Festival of Owls' keynote presenter, Dr. C. Stuart Houston from Saskatoon, Saskatchewan. Stuart has banded over 10,000 owls of 11 species, published 51 papers on owls, written reviews for 6 owl books, and inspired multiple generations of ornithologists, despite being a medical doctor himself. "He always involved other people in his work, from farm lads to grown people," says Dr. Robert Nero of Winnipeg, a Champion of Owls award winner himself and keeper of Lady Gray'l during her lifetime. "[His wife] Mary Houston is right up there with Stuart. They are a team." Stuart has been banding birds since 1943. To date he has banded over 7,600 Great Horned Owls, which led him to become the lead author on the comprehensive Birds of North America account on the species. 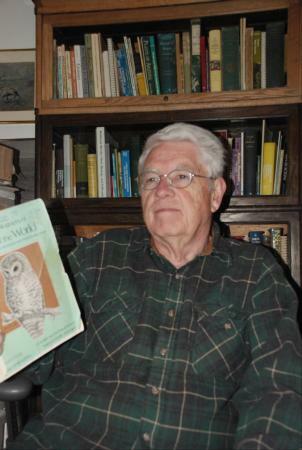 It was only by inspiring generations of farmers and farm kids to look for owl nests that he was able to band such vast numbers of Great Horned Owls. Innumerable people caught the owl bug from Stuart, with individuals going on to become a biology professor, a Minister of Conservation, a provincial ecologist, and many became bird banders. 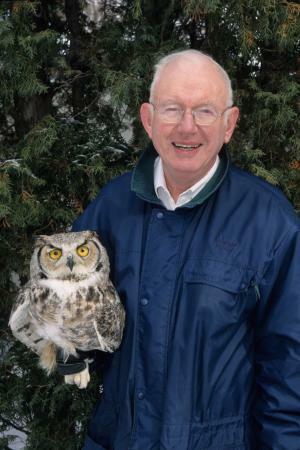 Stuart's Champion of Owls Award will join a long list of other awards on his curriculum vitae, including awards from the American Ornithologists' Union, Canadian Nature Federation, Raptor Research Foundation, and being named an Officer of the Order of Canada. Richard Clark, Ph.D. received a Special Achievement Award for his academic work on behalf of owls. His doctoral dissertation on Short-eared Owls was the first owl species covered in the Wildlife Monograph series. Richard served as an editor of the proceedings of the 1987 Northern Forest Owl Symposium, has published numerous peer-reviewed articles on owls, made presentations at scientific meetings in five countries, plus refereed over 100 papers for a variety of scientific journals. He has also served as an editorial consultant for a several reputable books and magazines. But Richard's most significant work for owls was serving as the senior compiler for the Working Bibliography on Owls of the World. This publication compiled 6,590 citations for all the known owl publications around the world at that time, required 11 staff-years of effort, and became an indispensable tool for innumerable owl researchers. He also served as Coordinator of the New World Strigiformes for the World Working Group on Birds of Prey, among other things. Barn Owls in The Netherlands owe a debt of gratitude to Johan de Jong, who also received a Special Achievement Award. Under his inspiring leadership of the Dutch Barn Owl Working Group, the species increased in the country from a mere 104 breeding pairs in 1979 to 3,160 breeding pairs in 2007. Johan has personally banded over 13,000 Barn Owlets. As part of his work, he has involved hundreds of volunteers and has taught everyone from schoolchildren to housewives about owls. His Royal Highness Prince Bernhard of The Netherlands even loaned Johan his infrared camera for his studies when the technology was new. Johan has written two books on the Barn Owl and created the annual Dutch National Owl Day. He also served as the chairman of the 2007 World Owl Conference planning committee, chairs the Little Owl Group in the Dutch province of Friesland, and has a daily segment on Radio Friesland highlighting the birds of the area. We were delighted that Johan flew in from The Netherlands to personally receive his award for his 30+ years of dedication owls and nature. A Special Achievement Award was presented to Paul Muriithi Kibuthu of Kenya for going against the grain to bring hope for the Mackinder's Eagle Owl. Despite growing up in a culture where owls are stoned to death as harbingers of death, Paul became interested in protecting owls through his involvement in the Wildlife Clubs of Kenya in school. He later observed owls while he farmed his land, learning their behaviors and eating habits firsthand. In 1997 Paul came upon an innovative idea after a group of foreign tourists inquired about where they could view a Mackinder's Eagle Owl. He pinpointed the whereabouts of all the local pairs and put up a sign along the road for tourists advertising his owl guiding service. He divided his guiding income with the farmers whose land surrounded the owl territories he was visiting. With a financial incentive and the knowledge that owls were helping to protect their crops by eating rodents, local attitudes towards owls began to change to one of protecting the owls instead of stoning them. Paul has gone on to become a member of the Mackinder's Eagle Owl project, studying the effects of land use practices and culture on owl conservation. He also promotes owl conservation in national newspapers and radio, and his work was even featured on BBCradio. An Aussie and tekkie with an enormous owl tattoo on his back was also conferred a Special Achievement Award. Deane Lewis of Maryborough, Queensland admits "The tattoo was what got me interested in owls--it was around 1997 and I wanted a tattoo that represented where my life was at that time, and decided on the solitary, wise owl." While researching owls for his tattoo, Deane found a scarcity of owl information on the internet. He soon remedied the problem by starting an owl website that inadvertently became the world's premier owl website, www.owlpages.com. Deane's award-winning owl website averages over 3,000 visitors per day, from schoolchildren to biologists. His website includes everything anyone could ever want to know about owls (or links to the information), several forums for everyone from owl fantasy book fans to owl biologists, news, research, mythology, and more. Deane also hosts the International Festival of Owls website and maintained the Global Owl Project website at no charge.He also helped compile a DVD with descriptions of all the world's owl species.